Workplace Efficiency: Laughter Yoga Enhances employees morale, resilience, and personal efficacy beliefs. This study measured the impact of a purposeful aerobic laughter intervention on employees’ sense of self-efficacy in the workplace. Effects of laughter therapy on depression, cognition and sleep among the community-dwelling elderly. This study investigated the effects of laughter therapy on depression, cognitive function, quality of life, and sleep of the elderly in a community. Laughter Yoga versus group exercise program in elderly depressed women: a randomized controlled trial. The objective of this study was to compare the effectiveness of Kataria’s Laughter Yoga and group exercise therapy in decreasing depression and increasing life satisfaction in older adult women of a cultural community of Tehran, Iran. Bio Psycho-Social Impact of Laughter Therapy on Stroke Patients. The study comprised 120 laughter therapy sessions using various laughter techniques, pranayama (deep yogic breathing exercises) and cognitive restructuring conducted on stroke patients between the ages of 40 to 90 in the Verulam Frail Care Community. It was done by Dr. Gita Suraj Narayan, a Senior Lecturer at the School of Social Work and Community Development, University of Kwazulu-Natal. Laughter and music could lower your blood pressure. This one was done in Japan and published in 2011. The psychological impact of Laughter Yoga: Findings from a one-­month Laughter Yoga program with a Melbourne Business. We have heard of PhD students doing their thesis on Laughter Yoga (yes, you can get a Masters Degree or PhD in Laughter Therapy!) but have been unable to make direct contact. If you know about this please let us know and we’ll be most happy to post the information here. One level down, here is a 60 pages thesis that Vasiliki Skrekou from Greece wrote for her Masters degree at the Center for Applied Psychology (John Moores University, Liverpool, UK) on the Effect of Laughter Yoga Practice on the lives of Laughter Yoga Professionals. 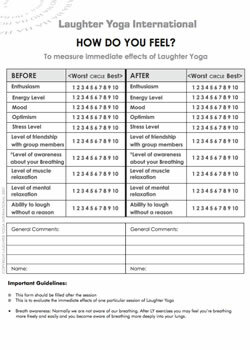 We know of several individuals who have carried out their own Laughter Yoga research over the past decade, but since these have not been peer-reviewed and published in medical journals they remain within the field of empirical evidence. [spoiler title=”The Copenhagen study in a computer business”] Thomas Flindt led a daily session of Laughter Yoga at the beginning of each work day throughout the month of May 2004 in Copenhagen, Denmark, with the sales staff of a computer company. 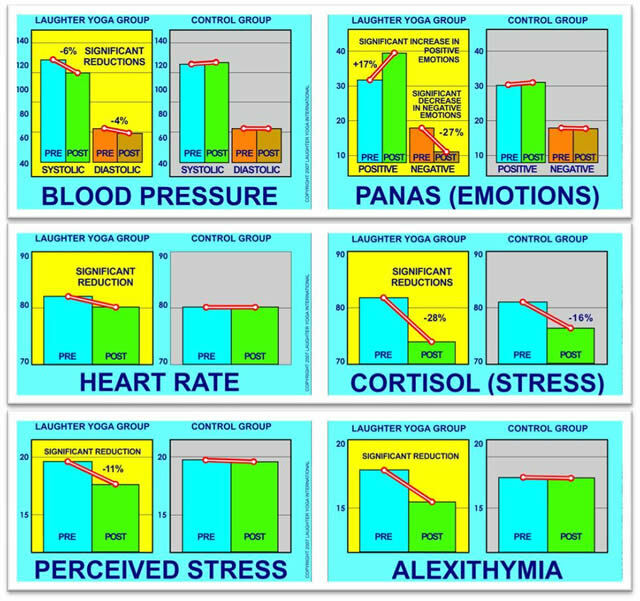 It showed clearly the effect that regular practice of Laughter Yoga has on stress levels. The study was made using an AIR-PAS (Artificial Intelligence Respiratory-Psycho physiological Analysis System), developed by Mr. Bo von Scheele, Ph.D., the Psycho physiological Institute at Karolinska Institute Stockholm, Sweden, and conducted by Mr. Anders Lonedal. A test group of four persons was randomly selected. The group was tested with the AIR-PAS at the start of the project, and consequently at the end of the same project. On an individual level, the results were remarkable. The body stress levels significantly reduced. The AIR-PAS test contributes also as an awareness raiser, that is, the individual becomes aware about how the body and mind interact. The importance of a correct breathing behavior was also highlighted. Laughter itself has a positive influence on the movement of the diaphragm, as well as the levels of stress hormones in the body. This entry was posted in Laughter Research and tagged breathing exercises, cognitive restructuring, efficacy beliefs, exercise therapy, group exercise program, laugh yoga, laughter therapy, laughter yoga, randomized controlled trial, school of social work, self-efficacy, workplace efficiency, workplace stress, yoga sessions on March 18, 2011 by Sebastien Gendry. In an observational study of 200 healthy normotensive IT call- center workers in Mumbai, India, 20-minute laugh-yoga sessions were associated with significant reductions in both systolic and diastolic blood pressure, Madan Kataria, M.D., reported at the American Society of Hypertension meeting. In the study, half the volunteers participated in seven 20-minute “laugh groups” over three weeks, and the other half were randomized to a wait list and served as controls. Mean baseline systolic pressure was 128 mm Hg in the laugh-yoga group versus 126 mm Hg in the controls. Baseline diastolic pressures were 82 mm Hg in both groups. Stress was assessed at baseline and after the intervention by cortisol level, as well as by the Positive and Negative Stress Scale and the Perceived Stress Scale. After the treatment, mean systolic pressure decreased by about 7 mm Hg in the laugh group versus no change in the control group (P<0.01) and diastolic pressure decreased by 3 mm Hg versus no change in the control group (P<0.05), Dr. Kataria said. Laughter, he said, was an antidote to stress and “these IT workers, although healthy, have very stressful jobs.” He noted that laughter was also associated with a significant reduction in cortisol levels (P<0.001). At the same time, participants in the laugh group had an 18% improvement in positive emotions and a 28% reduction in negative emotions (P<0.001 for both) and a significant reduction in perceived stress scale score (P<0.01). This study was presented by Dr Kataria at the American Society of Hypertension 2008 Annual Meeting in New Orleans, LO. 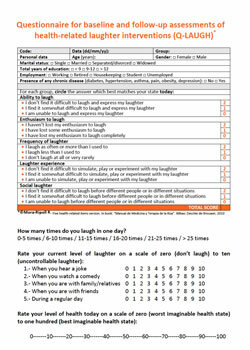 This entry was posted in Laughter Research and tagged laughter yoga research, unconditional laughter research, workplace stress on August 6, 2007 by Sebastien Gendry.